It’s World Mental Health Day today and Ramboll is supporting Time to Change, a growing movement that’s changing how we all think and act about mental health. Ramboll has signed the Time to Change Employer Pledge, joining over 800 employers who are determined to change the way we all think and act about mental health in the workplace. 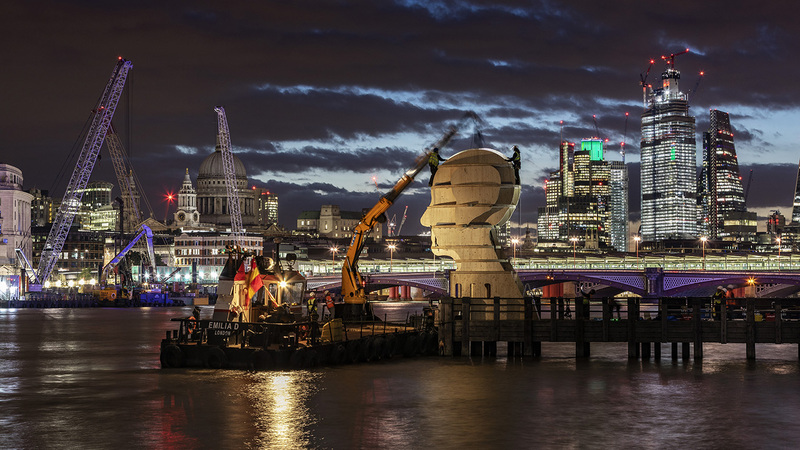 Dramatically changing London’s iconic skyline, Head Above Water sculpture is erected on Gabriel’s pier on the South Bank as part of London Design Week. One in four people experience a mental health problem and is why Ramboll supported the Head Above Water sculpture launched during London’s design festival. It helped to provoke discussion to end mental health-related stigma and discrimination. The pro bono work to support the Head Above Water project followed the signing of the 'Time to Change Employer Pledge' and we are continuing this endeavour by also supporting this years World Mental Health Day campaign that focusses on people to ‘ask twice’. When someone asks us how we are, the usual and expected response is “Fine, thanks”, but sometimes we say we’re fine when we’re not. If you’re worried about a colleague, friend or family member, asking twice can show you’re really interested and willing to hear their response – whether that’s straight away or later. Without support from others, people with mental health problems can lose what they care about most. So, if someone you know is acting differently, please be sure to #AskTwice from today. Time to Change is run by Mind and Rethink Mental Illness and thousands of organisations like us are joining to help make change happen. Read more about the campaign. HEAD ABOVE WATER from 7A Films on Vimeo. Today we are also announcing the winner of the Head Above Water photo competition. Head Above Water is a 9-meter-high, interactive, Cross Laminated Timber sculpture that was located on London's South Bank during London Design Festival. Its intention was to provoke discussion to end mental health-related stigma and discrimination. Congratulations to Robert Godbold! The winning photo was picked by Ramboll, structural engineer Alan Dowdall who led the Head Above Water project. Alan said about Robert's photo, “The simplicity of the image framing the sculpture as negative space makes this entry a great winner”. Robert commented "I am really pleased to have won! The installation was a really powerful statement for looking after our mental health. Hopefully this installation will go some way to helping people turn their attention to that part of their lives, both on your own and with the support of others. Work plays a big role and it’s important that we continue to foster, improve and strengthen a supportive culture at Ramboll." See a selection of Alan's favourite entries below.